Living in a tropical island gives us the opportunity to use the energy from the sun and produce electricity all year long. However, we also have to deal with stormy and sometimes dangerous weather. That makes the island's electrical system more expensive, and somewhat unstable. In Jag Engineers, we can help you forget about blackouts, brownouts or extended periods without power, designing an emergency backup power system for your home or business. In Puerto Rico, we conventionally use power generators, which solve the blackout problem, but also bring new issues like fuel management, noise, vibration, and smoke produced by combustion. They require extensive maintenance and can be unpractical for areas like apartments, walk-ups or small offices. 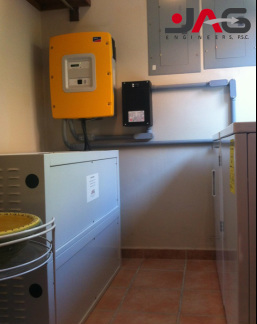 Because of all these inconveniences, besides offering design and installation of a power generator system, we have experience designing and installing battery backup power systems. 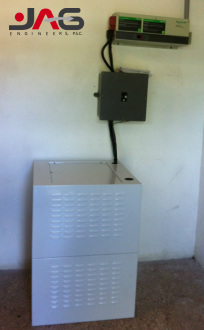 Battery backup systems convert the energy stored in specialized batteries into energy that you can use to power your appliances. They can be recharged by a renewable energy system like solar panels, or be connected to the electrical grid to be recharged when power from the utility is restored. This systems require almost no maintenance, don't emanate dangerous gases, or produce any noise. It will automatically disconnect from the grid when there is no power, protect your appliances from voltage surges or sags, and reconnect when it detects that the grid power is back and stable. They can be installed inside your property to power your basic electrical needs, and you won't even notice the utility power is gone!